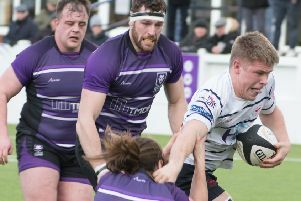 This result bettered their 25-0 defeat of South Leicester before Christmas and left head coach Paul Arnold “really happy” as they consolidated ninth place in National League Two North. “I told the lads I wanted five points and I told them at half-time I wanted five points and to ‘nil’ them,” he said after watching the game from an unusual vantage point on the roof of the clubhouse. “Our discipline went a bit for 10 minutes at the end of the first half, the second half was a bit hit and miss and we lost a couple of line-outs. But we stuck to the game plan to use box kicks to put them under pressure. Leicester Lions got off to the worst possible start, throwing an interception pass that allowed centre James Fitzpatrick to run half the length of the field for his eighth try of the campaign. Davidson converted and quickly added a penalty for a 10-0 lead in even time. There was a setback for the hosts when prop Oga Mabaya was stretchered off with a suspected ruptured Achilles, but replacement Noah Miller proved equally as effective in another powerhouse performance by the Hoppers pack. The Lions were regularly driven back at the scrums and, after half-an-hour, another huge effort brought a penalty which Davidson put within 10 metres of the line. 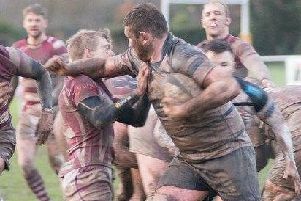 Although initial thrusts were repelled, flanker Teddy Leatherbarrow was on hand to drive over, with Davidson again converting. A moment of magic took the score to 24-0 at the break as a pinpoint cross-kick by Davidson, following a fine break by full-back Nathan Pope, found lock Ryan Carlson unmarked on the wing for a well-taken try, again converted. It was just reward for a fine all-round display by the recruit from Natal. If the fans were sitting back expecting an armchair ride to the bonus point in the second half, Leicester had other ideas and thwarted Preston at every opportunity while also giving the home defence a healthy workout. But Hoppers also defended resolutely, including heaving the Lions backwards and stealing the ball at a five-metre scrum. They even found time to squander a few chances themselves, especially when a series of attacking line-outs were turned over. But their patience finally paid off when they forced a succession of scrums close to the line and, as the clock ticked down to the final whistle, they got Leatherbarrow over for his second try, which clinched him the man of the match award, as well as the bonus point.